Last spring, just in time for SXSW, Justin.tv launched a new standalone video app that has a simple purpose: it lets you share short videos with your friends with just a few taps. The app adopted a model that’s very similar to Instagram’s, with a ‘follow’ system and quick sharing to services like Twitter and Facebook. And it got off to a strong start, with 250,000 downloads in its first month alone. It’s done so well, in fact, that six months after the app first launched, Justin.tv is spinning Socialcam off as its own independent company. Justin.tv cofounder and long-time CEO Michael Seibel will become CEO of Socialcam, bringing a small team of Socialcam’s orignal engineers with him. Justin.tv cofounder and current CTO Emmett Shear will be taking the helm as CEO at Justin.tv. 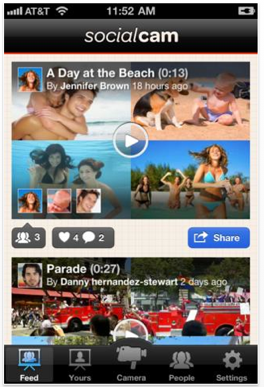 And Justin.tv will have a stake in Socialcam, which is currently in the process of raising additional funding. Seibel says that Justin.tv first began working on Socialcam around ten months ago, with the goal of launching the first version of the application within sixty days. At the time, the team set a handful of milestones they were hoping to reach, like getting 1 million downloads in six months, as well as other metrics around engagement. If they hit those milestones, Socialcam would live on — otherwise Justin.tv would move on to other projects. Then they blew those goals away. The app had 1 million downloads in its first four months, and Seibel says they handily beat their other engagement metrics as well. One stat that he finds particularly promising: 32% of users who have signed up for the service have created a video, which is says is far higher than expected. The small Socialcam team will be moving out of Justin.tv’s offices (which we recently did a TC Cribs tour of) and will be housed at Founders Den. For its part, Justin.tv is also hard at work on a second project that began around the same time as Socialcam: a gaming-focused streaming video portal called Twitch.tv. Seibel says that the site is also doing very well — it’s drawing 8 million unique viewers per month, who watch over 1 billion minutes of video. Justin.tv cofounders Justin Kan and Kyle Vogt will stay with Justin.tv.